The 1950s definitely enjoyed biopics, as evidenced by the amount I’ve previously reviewed (The Buster Keaton Story, The George Raft Story, Valentino). 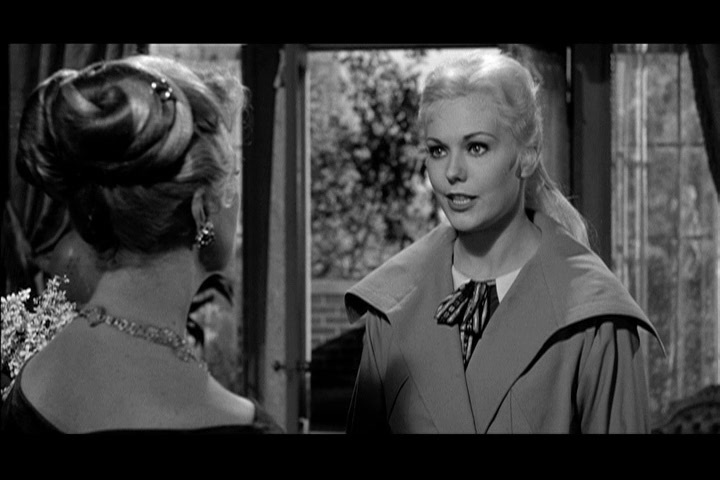 Probably one of the better remembered ones, Jeanne Eagels was the proving ground for Kim Novak as a dramatic actress. Lambasted by the family to the point that they sued the studio, and decried as a fictional account of Eagels’ life – what 1950s biopic wasn’t? – Jeanne Eagels does nothing new with the biopic formula, acting as a cautionary/morality tale for the pitfalls of fame with an added dose of 1950s feminine domesticity. Jeanne Eagels (Novak) wants to make it as an actress, but entitlement and alcohol end up sullying her career before it even gets started. Along for the ride is the domineering, but ultimately mild-mannered Sal (Jeff Chandler), the man who truly understands Jeanne. I’ve mentioned it with the likes of Valentino and Marilyn Monroe, but sometimes the gimmick of a star’s name makes the performance harder, particularly if there’s no resemblance between the actor and the subject. In Jeanne Eagels’ case, Novak’s job is even harder because audiences of the 1950s, and more so today, have no idea who Eagels was. By 1957, Jeanne Eagels’ name was all but forgotten, and even now only a few of her films are available to watch; most know of the Eagels films remade by Bette Davis (The Letter) and Gloria Swanson (Rain) more than the original star. 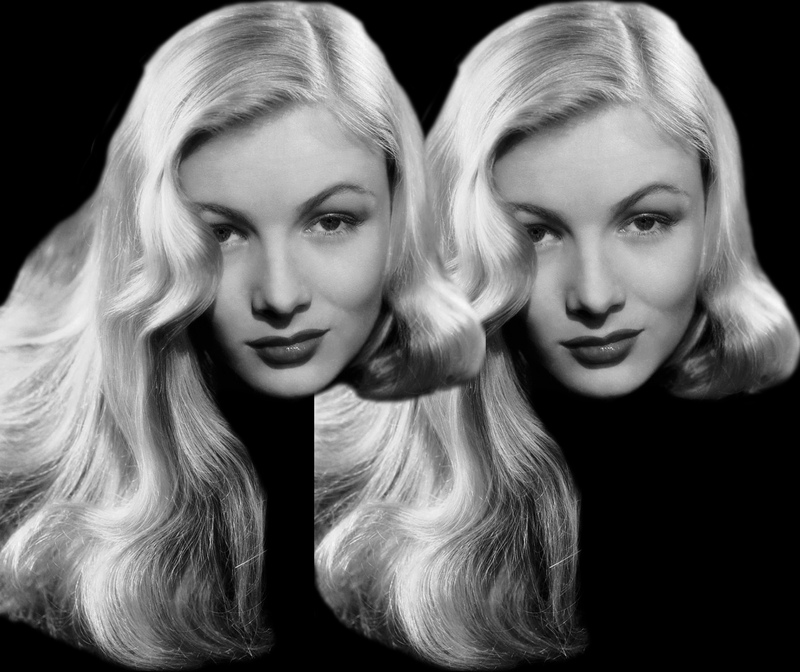 Where Marilyn and Valentino had easily identifiable traits and story’s, Jeanne is a blank slate. During the two-hour journey, we spend quite a bit of time with Eagels’ “beginnings” as a hoochie-coochie dancer in a carnival; Eagels’ neither worked as a dancer nor in a carnival. This is apparently the only means of introducing the character of Sal Satori, a male character culled and compiled from several men in Eagels’ life. Chandler is fine; he’s the Gary Merrill of the movie, providing advice and chastisement in equal measure. He knew where Jeanne came from and realizes she’s throwing her life away. Predominately, Sal extricates Jeanne from various professional scrapes. He’s the nice guy who, oddly enough, seems more tangibly written than the subject of the film. By the end, Jeanne apologizes to him for “robb[ing] you of those six children.” You don’t see Valentino apologizing to all the women he seduced in his biopics, or George Raft sincerely remorseful to his lady. Why is the overall moral of the story that Jeanne’s descent not only stems from alcohol, but her perverse desire to not settle down with Sal? I’ll tell you why, the 1950s! Yep, coming right at the peak of Donna Reed and the poodle skirt, it isn’t enough for Jeanne to be a perilous victim of fame like we’re all used to, she needs to be a cautionary tale for female non-comformity. Outside of that contemporary reading, the line just puts a bow on all Eagels’ problems so that, by the end, you feel sorry for her demise, shocking considering the film has demonized her and presented her as a social-climbing monster up until the climax. Robert Osborne’s introduction prior to the film’s TCM screening quoted several people who believed Novak was in over her head in the role. Novak evinces 1920s aesthetic, which director George Sidney plays up with several effective close-ups of her eyes, and has sultry down to the T during one of her hoochie-coochie dances. 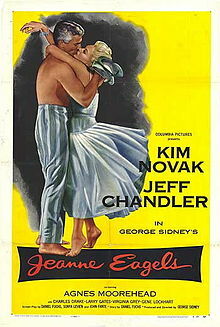 The film takes a bit too much joy in oogling her body, putting her on trial because “nature showered her with blessings.” When Novak is allowed to act, she has a tendency to speak her dialogue in a throaty rasp, more in line with Faye Dunaway playing Joan Crawford, an overdramatic series of exclamations. Really, the overdramatic emphasis is what ruins Jeanne Eagels. Nearly every sequence just exacerbates the bad melodrama. When Agnes Moorehead tells Jeanne to “stop the bad dialogue,” she has no idea how right she is. Other elements seem ripped from television: the declaration that Jeanne “met her match…the bottle” or the saxaphone “wa-was” as Eagels’ drinking becomes uncontrollable, dubbing her “Gin Eagels.” It’s hard connecting with Eagels’ story when everything plays so generically. Novak’s performance gives off a strong dramatic flair, although she did better work in Picnic, released two years prior, and Vertigo, released the year after with Jeanne Eagels being a minor blip on her resume.